Ambarisha performed a yaga, but at the crucial moment, the animal intended for the sacrifice escaped. Now the priests ordained that to make amends for this sinful neglect, a human being should be offered as a substitute to the gods. The King promised 1.000 cows in exchange for a son, but which father will send a son to death, even when 1.000 cows are given in exchange? There were also other conditions; the King's messengers should not ask any one for the son; they should not commit the sin of equating 1.000 cows as equal to a human being; the father too should not bring the sad offer to the son; the offer to immolate himself must come unasked from the son, without any prompting or persuasion; it is only such a son that will be accepted by the Gods. Now, S'unahs'epha heard the news by himself and approaching his father he said he would go and gladly too. For, what greater good fortune can a mortal expect than ascending to heaven through the sacrificial flame? S'unahs'epha persuaded his father that his wish to proceed to the yajña and offer himself was legitimate and approvable, and left for the capital. On the way, he went to his maternal uncle, Vis'vâmitra, who tried to keep the boy away from the sacrifice. "This is all just foolish superstition; can any one substitute a man for a cow", Vis'vâmitra asked? S'unahs'epha replied that all men are cattle, for until viveka and vairagya dawn, they are but animals. So, in spite of his uncle's arguments - arguments like the ones used by some to dissuade persons from coming to Puttaparthi, - S'unahs'epha managed to reach the yagasala. In the same way as the lights before us are lit when a switch is moved up at Penukonda, when the Lord decides on some thing, it has to happen so. Well, the Lord is not a rock or a stone; His heart melted at the plight of the boy. Indra appeared in the sacrificial fire and departed showering blessings on his head. It was Indra who had carried away the original Cow and elaborated all this plot, to bring S'unahs'epha and his greatness to light and to bless him. Let me tell you an incident which happened while in the previous body at Shirdi. There was a lady from Pahalgaon, a simple, illiterate devotee. She stored water in her kitchen in three clean, brightly polished brass pots from three separate wells and she had named the pots, Ganga, Yamunâ and Sarasvatî. She always referred to them by those names. Whenever any thirsty wayfarer called at her door, she mixed water from all three and offered it to the person as Triveni Tirtha. Neighbors used to laugh at her faith, but her belief that the three wells were connected underground with the three rivers that joined at Prayag, was unshakable. Her husband started on a pilgrimage to Kâs'î (Benares). His mother while blessing his departure, put on his finger her own golden ring and directed him to take good care of it, for it would be a talisman for him. When he was taking the ceremonial bath at the Manikarnika Ghat, the ring slipped into the waters and could not be retrieved. When he returned and related this story, he said, "Ganga wanted it, she took it", just to console his mother. When the wife heard this, she said, "No, no, Mother Ganga will not hanker after the property of a poor old lady. She will accept only what is offered out of love. She will give us back the ring, I am sure. I shall ask Ganga, she is in our kitchen". So saying, she went in and with folded hands, she prayed before the particular pot named by her as Ganga. Putting her hand in it she searched the bottom and ... sure enough, she got the ring back. She had come to Dwarakamayi with her husband and mother-in-law. It is faith that matters; the form and the name on which it is fixed do not matter. For all names are His; all forms are His. The gopîs had no other goal, no other ideal, no other wish. It was a surrender of the self - complete, unquestioned, unwavering. Let me tell you of a devotee, a woman in a small Maharashtra village, who lived in the last century. She went through even the little details of life in this spirit of dedication. Walking was to her a pilgrimage, talking japam. Even when she threw off a ball of cowdung after applying it over the floor used by her husband to keep his dining plate on while eating, she said and felt "Krishnaarpanam - May this be an offering to Krishna!" Her tapas was so sincere that the cowdung reached Krishna and stuck to Krishna's idol in the village temple every day! The priest saw the mysterious defilement; he was amazed and was lost in terror. He cursed himself that he had lived to see that sacrilege. Daily, about noon, the same size of cowdung! He hung his head in shame as he walked along, keeping the disturbing phenomenon all to himself. One day he heard that particular lady exclaim "Krishnaarpanam" as she, like many other house-wives, threw the tell-tale cowdung ball. He suspected; he noted the timings, the quantity, the material etc., until he was convinced that she was the culprit for the disfiguration of Krishna, the defilement of that loveliness. Then he beat her so severely that her arm that threw the dung was fractured. When he returned triumphantly to the temple expecting to be profusely blessed by the Lord for punishing the wicked woman, he was shocked to find Krishna's right arm fractured and bleeding, exactly like the woman's arm! The poor fellow wept in his agony and said, "I beat her only through love of You; she spoilt Your charm, oh Lord." Krishna replied, "You must love all whom I love, remember". Here too, I want that you should so behave ... or at least love yourself, that is to say, love your own better self and 'best interests'. I will not tolerate envy or malice or hatred among devotees nor will I allow you to hate yourselves or think of yourselves as mean or weak. Here is a small story. An individual who was living and being educated according to the ancient traditions of India, wanted to go abroad for higher education. His father took the son to the Goddess and prayed that his son should be kept safe and should return safe to India. The son, seeing the father worship the Goddess, also prayed to her in the same way. He was out of India for two years. The boy who had lived in India for 24 years was abroad only for two years. After completing his education, he wrote to his parents that he would be returning home. The parents were overjoyed and met him at the airport. They wanted to take their son to the room where the Goddess was and make him offer worship. As soon as the boy alighted from the plane, they noticed that he was in Western clothes. Without bowing to them he asked, "How are you, mummy?" The mother did not mind it, she was very affectionate and blessed her son. They took him home and he consented to visit the Goddess. On entering the main gate, he refused to take off his shoes and became impatient. He thought his parents were uncivilized. While praying, they asked him also to pray to the Goddess but he just put his hands in his pockets and refused to do so. When they asked him to do namaskar to the Goddess, he asked instead "How are you, mummy?" The father was so annoyed that he slapped his son in the face and said: "You went to the West with the grace of the Goddess and after returning home, you have forgotten her. You have become ungrateful and you are not fit to be my son. The traditions you learnt in 24 years have been forgotten by you and the manners and the way of life you learnt in another country in two years are now with you. Will they live with you permanently? It is foolish to imitate. Even ruin is better than to follow another's habits. If we follow our own habits, it will give us joy, happiness and sacredness". Because your eyes are directed outward, you will be able to find the faults in others only, but you will not be able to find the fault in your own nature. Here is a small story. During the summer season, in places round about Nagpur, water will be very scarce. Things might have improved now, but in old days things were very bad. An orthodox old brahmin lady set out on a pilgrimage. She was so orthodox that she did not touch anything or anyone and she did not permit anyone to touch her. She started on a pilgrimage with such an orthodox mentality. By the time she reached Nagpur, she felt that the weather was very hot. She turned on the water taps but not a drop of water came out of them. Her thirst increased. The Government made some arrangement in that station for supply of water. The skin of an animal was used to make a bag. They filled water in such bags and supplied that water to the thirsty people. When several people were drinking the water that was served from that bag 0f leather, this lady, though she was thirsty, was hesitating in her mind whether the man who was serving the water may belong to a low caste; the bag may not be pure and may not have been cleaned well and so on. She was hesitating to take water. After much hesitation, the lady who could not suppress her thirst, went forward. She questioned the man who was serving the water. "My dear Sir, is this bag pure? Is it clear?" The man who was serving the water was clever. He said, "The bag of leather from which water is being served, is cleaner than the bag into which that water will be poured after service, namely, your body. This bag is cleaner than your interior." Today we are cultivating this undesirable tendency of looking at the impurity of the bag but not caring to remove the impurity from within our own body. There were three fishes in a pond. One fish said to the other two: "The water in this pond will run dry day after day. A time will come when the pond may become completely dry and before the fisherman comes to catch us, it is necessary that we go and stay in some place where there is a perennial supply of water". The second fish said: "You are imagining. Your mind is full of needless fears. The pond will not run dry. The fisherman will not come to bother us. Enjoy your present state." The third fish was discouraged when the other two did not accept its advice and so it had to share their fate. As anticipated, the fisherman came and trapped them, cooked and ate them. Our life may be compared to a pond and the length of our life to the water. The three fishes are the three gunas, tamas, rajas and sattva. The sattvic tendency always decides to follow the path of good and fixes its attention on things which are permanent. It decides that before the level of water runs down, it should save itself and it always thinks of noble things. Water has been compared to the length of life and day by day it recedes and at any time death may overcome it. The fisherman is the emblem of death. Tamas and rajas are antagonistic to sattva and therefore even the merit of sattva is counteracted by the other two. These two gunas, tamas and rajas, mislead our senses and send them along the wrong path. We should first try to control tamas and rajas and thereby attain mastery over our senses. If we follow good methods even rajas and tamas may be conquered by close association with sattva. Today people who call themselves leaders are not doing good service and as a consequence, the world around us is becoming very confusing. In this context, a story relating to the Krishna avatâra has to be mentioned. One day Krishna approached Yas'odâ and told her that all his cowherd friends had invited him to go with them and tend the cows and that he was planning to go. The mother explained to him that to go to the forest would mean that he would have to walk on thorns, that he might have to meet snakes and that he might get close to bushes. She said that his tender feet might not be able to put up with the troubles and she said that it would be better if he put on foot-wear before going to the forest. She said that shoes for him would be ready only the next day and he could go to the forest only the next day. 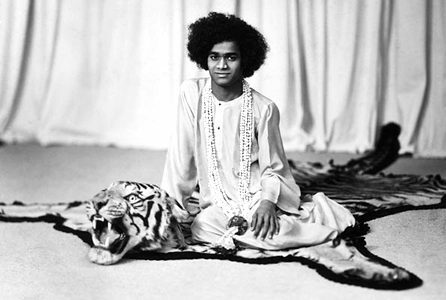 Immediately Krishna asked the mother to tell him how she addressed him. She said that his name was Gopal and that she addressed him by this name. The word Gopal stands for one who tends the cows. He said that he had acquired that name because he could tend the cows and be the leader of the cows. Since the cows would follow him as their leader, he said that he would have to do something which the cows would also do. The cows do not have shoes to protect their feet and therefore he said that he also should not have shoes to protect his feet. He said that he would do only that which persons who follow him could also possibly do. He said that if he wore shoes, the cows would also want to wear shoes, because their leader was wearing shoes. He was not going to wear shoes and allow those whom he had to protect to go without shoes. This is how he argued with his mother. This simply means that when God takes a human form, men will try to imbibe His qualities and will behave like Him. There was a small temple of Srinath in the town of Govardhana, some centuries ago. A poor brahmin of that place had an only son, a little boy of six, who was always exulting in the stories and legends of Krishna and who delighted only in listening to the lîlâs of the Lord. One day, he went out into the meadows with the cattle and when he saw the temple and the image of Krishna inside the shrine, he took it to be the Lord Himself. He called out very piteously asking Krishna to come out and play with him in the moonlight. Though the doors were locked by the priest as he went out at noon, the Lord came and hand in hand the two walked along the fields in the cool silver light. Krishna had the flute and he sat on a boulder and played on it to the extreme delight of the brahmin lad. After a few hours, He returned with the friend, whom He called 'brother' and, quite unnoticed, He disappeared into the temple shrine, where the idol could be seen through a slit in the door. The boy could not bear the pangs of separation from His divine playmate; he spent the night and the morning crying outside the door and he was discovered there by his parents and the priest. The parents beat the boy for giving them so much trouble, but, the priest found the idol bleeding, as a result of the blow. If you call on Him as a little brother, He responds and becomes a rollicking playmate for you. Call on him as a Guru. He will instruct and inspire. He never fails those who call on Him sincerely and in faith. A king once announced that he will honor with a big gift any brahmin who will agree to do anyone of the following three evil things; 1) He must aver that the Vedas are false, or 2) He must drink liquor, or 3) He must elope with another's wife. For a long time, no one within the seven seas came forward to do any of these atrocious things. At last a poor brahmin on the verge of starvation came into court and offered to drink liquor, an evil which he considered the least reprehensible of the three. But, as soon as he got drunk, he began to swear and curse and in the excitement of intoxication, he shouted in the streets that the Vedas are a tissue of lies; he entered the house of his neighbor and assaulted the lady of the house, like the worst criminal of the land. One thing led to another! When Jesus Christ entered the precincts of the temple of Jerusalem, and found people sacrificing doves and birds and other living beings to God. He released the birds and condemned the acts of blood. The priests and scholars resented His act and argued that the God in whom they had faith accepted the sacrifice and was propitiated thereby. They asked him evidence of his authority to interfere with the dictates of religion. Christ went on to tell them a parable. "Once there was a farmer who had two sons. He asked his first son to go out to the field so that he may watch the crops, ready for harvest. The son refused to obey him. Thereupon, he asked the second son, and he readily agreed. But, what really happened was, the second son later calculated the bother and the sleeplessness which the watching will bring to him; so, he did not go. The first son later repented for his refusal to do what his father asked; he went and watched the crop. Now, Christ asked, who among these two pleases the father more - the son who declared his assent by word of mouth and disobeyed in action or the son who disobeyed by word of mouth but obeyed in action?" "You may obey in words but disobey in action. My action reveals that I do acts which God commanded. You are your own witness, whether you follow the dictates of the Divine Father. I have greater authority than you, for, your action shows that you disobey whereas my action proves that I follow His commands". There was a king called Sathyavrata, in ancient times. He was named so because Truth was his way of life, his goal and his guide. He derived great joy through the strict adherence to truth. One day, a few hours before dawn, during Brahmâ-muhûrta (the time dedicated for meditation on God), he proceeded alone through the lion gate of his fort, in order to have a holy dip in the sea, for the day was a holy one marked out in the calendar as sacred for such ceremonial baths. While he was passing through the gate, he saw a fair maiden with a halo of splendor going out. Curious to know who she was and why she was making her exit at that early hour, he accosted her. She replied that she was the Goddess of Riches, Dhanalakshmî. "I have been long here, now I desire a change. I do not stay in one place long". Sathyavrata told her, "Go! go! I do not object or obstruct". After that, a charming masculine figure was seen quietly going out through the lion gate. The King asked him who he was and on what errand he was leaving. He replied, "I am Charity; when Dhanalakshmî has left, what do I stay here for?" The King allowed him to leave and he moved on. Within a few minutes, another charming person was going through. The King found that he was Sadachara, representing Goodness in Social Behavior. "How can good social relations be sustained without riches and the quality of generosity" he asked. "I am leaving, because the two here are no more," he explained. The King agreed; and he moved on. So too, the next emigrant Fame, lamented the departure of the other three and himself wanted to go. The King let him go. He said, "How can Fame survive the absence of Riches, Charity and Happy Social Life?" and the King felt he was right. Meanwhile, a person with overwhelming splendor came into the gate from the fort, with the intention to leave the city. When asked who he was, he said, "I am Truth". 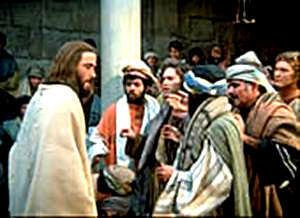 At this, the King pleaded with him to stay in the city, the Kingdom, the palace and the homes of the people. He said that if he would leave, the loss would be irrepairable and life would not be worthwhile. At this, Truth decided to stay. There was once an old woman in a village. She sold a patch of land that she owned, and with the money, she had four gold bangles made, two for each arm. She wore them with great joy and went along the streets very proud of her new acquisition. But, she was disappointed because no one in the village turned aside and looked at her bangles; she could as well have not worn them, for the villagers did not notice any difference in her. She tried various means to attract their attention towards the bangles, but, without success. One night she could not sleep at all, for, this neglect pained her much. At last, she got a brilliant idea which, she decided, must succeed; the villagers must be drawn to notice the bangles. Next day, after sunrise, she set fire to her own dwelling house! When the flames rose, and commotion ensued, the villagers rushed towards her, sitting, wailing in front of the burning house. She shook her hands pathetically at the faces of the frightened villagers, causing the bangles to jingle and shine in the red light of the high flames, crying out, "Alas! My house is on fire, 0, pity my fate, God, don't you see my plight ?" Every time she shouted a sentence, she put out her arms vigorously at some one; so that she or he could not miss sighting the bangles. The pity of it! She was so anxious to exhibit her bangles that she did not care for her house itself; the house was on fire but she was happy her bangles were noticed. The scholars who are lost in admiration of their own cleverness are as foolish as this old woman. You may be compassionate, but, that emotion must be regulated and wise. A compassionate man once brought home a fish he found struggling on the bank of a river in full flood. He placed it between the folds of the warm blanket and poured hot coffee down its throat. He thought it was suffering from a fit of cold. The hot coffee killed the poor thing. He could have saved it by throwing it back into the floods. He lacked the intelligence which would tell him what to do to express his compassion. Sibi was a genuine sadhak, having attained a high stage in detachment and the spirit of renunciation. The Gods decided to discover whether his achievements were deep-rooted and unshakable. Agni (the God of Fire) and Indra (the God of the Heavenly Regions) took on the forms of a dove and hawk. The hawk (Indra) pursued the dove (Agni) across the sky, until the frightened bird fell into the lap of Sibi sitting on his throne, pleading for protection from the hawk. 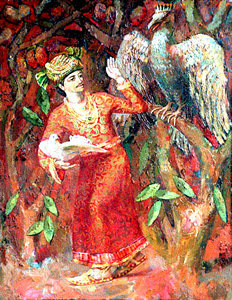 As befitted his dharma, Sibi gave word that he would save the dove from its enemy and assured full protection for it. At that moment, the hawk presented itself before the Emperor and demanded its meal, its legitimate prey. "I am hungry, I had secured my food; you have deprived me of my meal", it complained. "Of what use is all your vaunted spirituality if you rob me of my meal? ", it lamented. At this, Sibi said, "Yes, I shall slice off flesh from my body weighing as much as this dove weighs; you can appease your hunger with that." The hawk agreed. A balance was brought; the dove was placed on one pan, pieces of flesh cut from the body of Sibi were placed in the other pan. But lo and behold, however many pieces of flesh were laid thereon, the pan on which the dove sat, did not rise at all. It was indeed a mystery how the bird weighed so heavy. At last, Sibi said, "Well, you can take all of me. Eat me whole. Here I am at your disposal". No sooner did he utter those words than the hawkbecame Indra and the dove was transformed into Agni - Gods effulgent in their glory! They were supremely happy at the depth of Sibi's spirit of renunciation; they blessed him profusely and departed. There was a rich man once who owned a rice mill. He heard a pundit expound that the service that God appreciates most, is the gift of food to the hungry. So, he decided to serve food to the poor in his village. But he had no mind to use good varieties of rice for the purpose. He felt that any rice is good enough for them. So, he got the rice that was rotting in his godown - he did not care even to remove the worms that infested it. He cooked it and served it to the hungry poor, who ate it and suffered many illnesses as a consequence. His wife expostulated with him and told him that good food given to 10 persons would be more meritorious than bad food given to hundreds! But the rich man was in no mood to listen to sound advice from his wife. The wife therefore hit upon a plan to teach him. She placed on his plate food that was rotten and full of worms. When he grew angry and castigated her, she replied: "The pundit said that every one has to suffer for the injury he causes others; you have to eat, in the other world, rotten food, full of worms. I am giving that type of food to you even now, so that you may get used to it. It will help you to eat the consequence of your evil deed". At this, the husband realised his iniquity; he repented for his wrongs and learnt better ways of service to the poor. A mother used to carry her son on her shoulder, when she went to the market. A woman with a basket of fruits passed by her; the child lifted a banana from that basket and started eating it. The mother noticed it, and when she was told that he had cleverly lifted it from the basket of a passing fruitseller, she complimented the son on his smartness. This made the child indulge in petty thieving and picking pockets, as it grew into a boy - and in actual house-breaking and dacoity. Once during a dacoity, he committed even murder, and when he was caught and jailed, he expressed a wish to see his mother before being hanged. The wailing, weeping desperate mother was brought before him. She was sobbing at her son's fate. The son asked her to come closer to him; suddenly, he tried to strangle her, and the guards separated them. The son said, "She deserves the punishment; for, it was she who brought me to this doom. Had she reprimanded me when I stole a banana, when I was a child of two years, instead of complimenting me, I would not have fallen into this, evil way". 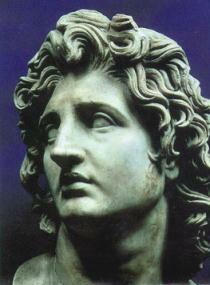 There is a story of Alexander the Great, which illustrates the glory of Indian culture. It seems Alexander used to go incognito to the villages around his camp, in India, in order to learn the habits and manners of the strange new land into which fate had brought him. One day, he found a man pleading with another to accept a pot of gold, which the other was refusing even to look at! He came to know that the pot of gold was discovered under the soil of the field purchased by the man from the man who refused to accept it. The buyer argued that he had bought only the land and was therefore not entitled to own the pot of gold; the seller said he had no right to any thing found on or in the plot that he had sold. Alexander watched this contest for some time; both did not yield. At last, the village elders were called in to decide the issue. And, even as Alexander watched, the elders found a happy way out; the buyer's son shall marry the seller's daughter, and the pot of gold shall be given to the bride as dowry! Alexander felt elated at the heights to which human virtue could rise; he was also ashamed at his own adventurous ambition to conquer another's property by force of arms. The ideals underlying the ancient culture of India have to be studied and practised by every Indian at least, so that the world might have the benefit of the great example this can provide. Once a district educational officer was inspecting a school. He asked the teacher to find out from one of his pupils as to who wrote the Ramâyana. The pupil innocently replied, "Sir, I never wrote it; perhaps you might have written it". Then the teacher found himself in a miserable plight and turned to the inspecting officer to assure him that he had not done so and tried to enquire if the officer had by chance written the work. The district educational officer referred the matter, to be safe, to the vice-chancellor, who finally observed that some brahmin must have done it and advised the officer concerned to close the issue. This means that the state of affairs in our educational field today is so pitiable that our students, teachers, inspecting officers and vice-chancellors are all sailing in the same boat. Nobody knows about the author of a work like Ramâyana. In these circumstances we are not justified in calling ourselves educated. Among all the wondrous adventures that astounded people during Krishna's childhood, revealing the divinity that had come among them, the Kâliya episode is the most meaningful. The serpent Kâliya was poisoning the waters of the Yamunâ and the atmosphere over it with its breath; all who approached that area, men or cattle, fell dead. But, Krishna--the divine Boy-jumped into the depths, forced the foul snake to rise above the level of the river, and leaping on its hoods, danced upon them with His tender lotus feet. The pressure of those soft silken soles was enough to force the deadly poison out from the fangs of the monstrous cobra and render it harmless forever. Ambarîsha Mahârâja: the story of Ambarîsha can be read in S.B. 9.4 and 9.5. S'unahs'epha: the story of S'unahs'epha and Vis'vâmitra can be read at S.B. Canto 9, chapter 18: King Yayâti Regains His Youth and in Summershowers, ch. 7. Jîva-tattva: the category of living beings (see âtmâ) who are the utterly small but complete parts of the Supreme Personality. Âtmâ: soul, but also: body, mind, senses. -'The soul is eternal, does not dwindle, is pure, the individual, the knower of the field, the original foundation, the unchanging, self-illumined, actual cause, pervading all, independent and unmoving. From these twelve symptoms of the soul is a conscious person impelled to give up the false conception of 'I' and 'Mine' that originates from the illusion of everything that belongs to having a body (SB 7.7: 19-20)'. - The end of the illusion of I.